There are many people in remote corners of the world desperate to know… someONE cares. There are millions without access to basic health care and have never heard the Truth of Jesus. Since 1974 CERT has connected the willing to the lost and suffering. Our ministry model follows the Life of Jesus… we too touch the physical needs and preach the Gospel. We are simply a way for you to pour your gifts back out to God… into the lives of the poor and needy. As a CERT volunteer, you will experience “life-saving” ministry first-hand as you care for and love on “the least of these.” Doctors, PA’s, nurses, dentists, hygienists, medical and dental professionals of all types are needed. Non-medical participants are also greatly needed… to help in the areas of triage, pharmacy, spiritual pharmacy and many other ways. All you have to do is say yes… and we’ll help you with the rest! WANNA GO? Have some questions? Call us at 1-888-299-8502. We want to help you answer the call and experience the life giving journey of a short term mission trip. 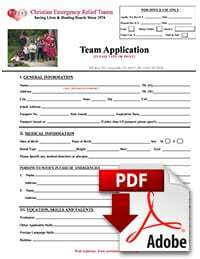 Fill out TRIP APPLICATION FORM. Mail it with an enlarged color copy of the photo page of your passport to CERT International, PO Box 763, Crossville TN 38557. If you do not have a passport we can help you get started with that too. Option 1: This the fastest way for your form to make it to us. *These are for your & CERT’s protection. We must be consistent and follow proper protocols. All CERT Team Members are expected to refrain from all use of and any form of alcohol or tobacco while on the mission field. CERT exists to serve people in dire need of health care. We GO where there is little if any help available, which often takes us into extremely remote locations.